We are currently in the process of building our own online store so you can shop directly from our website. Until that is completed all our products are available online from our Big Barn Store. 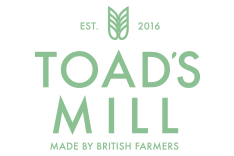 Toad’s Mill flour is also now available to buy from several farm shops, delis and bakeries across the Three Counties. To tie us over until we have our online store up and running we have chosen to team up with Bigbarn to make our products available to the public. Bigbarn is the UK’s number 1 local food website, helping you find good, safe and accountable food from local sources.